The Quality Street holiday album was hailed as “characteristically great” (New York Magazine) and “unimpeachably tasteful” (Washington Post) when it came out. 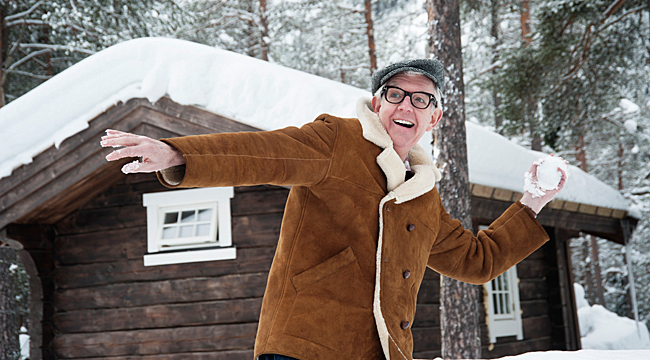 Dubbed a “sleighbell-free zone” by singer-songwriter Nick Lowe, the terrific collection of tunes succeeds because it’s so understated. Best known for his 70s/80s hits like “Cruel to Be Kind” and “(What’s So Funny ‘Bout) Peace, Love and Understanding,” Lowe is a genial guy who seems to just get better with age. He phoned us from his London home to talk about the album and his upcoming tour, his first-ever stateside jaunt in support of the disc. Talk about the concept for Quality Street. I t wasn’t actually my idea. Glenn [Dicker] who is the president of Yep Roc suggested it. I was very unwilling to begin with. I didn’t want to do it at all. Over in this country, we have a word for it — “naff.” The root idea is that something is uncool, but it means kind of vulgar. I thought, “Oh dear, I can’t soil my hangs on this sort of thing.” I thought that for 45 seconds or a minute. I quickly changed my mind and I thought it could be really good fun. I rounded up the boys and girls that I play with and we got down to it. It was the Christmas before last. I got a really bad flu and was ill for five or six weeks. When I got better, we spent a couple of months finding the material and then we recorded. We recorded in the summer which was sort of weird. We were making a Christmas record in short sleeve shirts and flip-flops. Did you write all the songs? No. Initially, I wasn’t planning on writing any at all. We wanted to find some that were overlooked. Most people do the same 12 songs when they do these records. I wanted to do some that people don’t hear all the time. But I didn’t want it to be too artsy fartsy either. You don’t want to miss the spirit. I wasn’t planning on writing any but you get carried away with it. They don’t call it Christmas for nothing. You do get carried away. I found myself with a couple of good ideas for songs. I thought that would show people that I was taking it seriously. The album starts with “Children Go Where I Send Thee.” It sounds like it could be an old folk ballad. I have only heard it done by wholesome folk groups. We revved it up a bit and put some rockabilly in it. I think it came out really, really well. What about “Christmas Can’t Be Far Away”? That’s a good song. It’s written by Felice and Boudleaux Bryant who wrote a lot of songs for the Everly Brothers. “Christmas at the Airport” is one of your tunes? Yes. It’s about a bloke who’s trapped in the airport over Christmas. I found myself in the Zurich airport nursing a slight hangover. The idea came to me and I had written it in my head by the time we landed at Heathrow. Someone pointed out that the character in the song sounds like he’s quite pleased by being locked in the airport. I think there’s some truth in that although I wasn’t aware of it at the time. “Old Toy Trains” is a song by Roger Miller. Talk about that one. “That’s a lovely song. I had never heard it. One of my friends suggested it. I have a lot of music-loving friends. A lot of songs turned up. There are great Christmas records but songs are not always good songs when you deconstruct them. Finding songs that people don’t know well, that’s more of a tall order. This one turned out particularly well. Our drummer found that one. It came on a kids’ record label from the ’50s. It was the Peter Pan label. It was like a Mister Rogers neighborhood-like character that did it. It sounded like it was for babies. The drummer thought it was a good song and we could put another beat to it and changed it around and do something good to it. He was dead right. Your friend Ron Sexsmith wrote “Hooves on the Roof.” Talk about that one. He came down the studio one night when we were recording and we played him a few things. The next day he sent me “Hooves on the Roof.” I think he just went back to his hotel and wrote it in the lobby. We were very pleased with it. “I Was Born in Bethlehem” is another song you wrote. I dreamt the song. It’s that funny period right before you wake up. The idea is that you are sitting on the plane next to Jesus and have a couple of cocktails and ask, “What do you do?” He tells you what happened. And what made you want to take on “Silent Night”? That one goes without saying. It’s a brilliant tune. There’s a reason that it has been covered more than any other Christmas song. It’s a real cracker, excuse the pun. We were just messing around in the studio. I started doing it. It has a London sound about it. It sounds kind of like rock ‘n’ roll and the horns sound like they’re Caribbean. That little squirty organ makes it sound Caribbean too. You wrote “A Dollar Short of Happy” with Ry Cooder. He was asking me what I was up to. I told him I was doing a Christmas record. He was very dismissive. He thought it was a load of nonsense. I told him we were having fun doing it. A couple of days later he sent me some lyrics and I put the tune to it and came up with a nice Christmas song. “I Wish It Could Be Christmas Every Day” is one of the more modern Christmas songs. It’s about 40 years old. It came out in 1971. It’s a fantastic record. It never really made it in America. Over here, it’s a huge, huge song. You hear it absolutely everywhere. I don’t know if anyone ever covered it. I thought I would have a go. We took out every other chord. If you do that, it’s more of a rock ‘n’ roll song. The original version is much more of a Phil Spector, kitchen sink-type of thing. And you haven’t really taken this show on the road before, have you? I did a few solo shows last Christmas. I did Letterman and Fresh Air and a couple of the novelty shows. And you’re touring with Los Straitjackets? They’ll be my backing band. I want them do the songs in their style. I’m going to join them rather than have them try to play the songs exactly as they are on the record. I think it will be much more fun that way too.